Record streak official. Heat Advisory and possible record temps to come. It is official – we have broken Denver’s 107 year old record of consecutive days with over 90 degree temperatures. Thursday marked day 19 in the streak, moving past the old record of 18 days set way back in 1901 and 1874. As a sidenote, the weather geeks at ThorntonWeather.com are actually hoping we break 100 degrees today. Since going into service in October 2006, we have never recorded a 100 degree or higher temperature. In the 21 months we have been in operation, the highest we have measured is 99.7 degrees (on August 13, 2007). A PERSISTENT HIGH PRESSURE RIDGE OVER THE SOUTHWESTERN UNITED STATES WILL PRODUCE VERY WARM TEMPERATURES OVER NORTHEASTERN COLORADO TOAY. HIGH TEMPERATURES ARE EXPECTED TO CLIMB ABOVE 100 DEGREES ACROSS PORTIONS OF NORTHEAST COLORADO. A HEAT ADVISORY REMAINS IN EFFECT FROM 1 PM THIS AFTERNOON TO 9 PM MDT THIS EVENING. TEMPERATURES ACROSS THE PLAINS ARE EXPECTED TO BE IN THE LOW AND MID 90S BY EARLY AFTERNOON. READINGS ARE THEN EXPECTED TO PEAK BETWEEN 98 AND 103 DEGREES BY MID AFTERNOON. THE MERCURY WILL PROBABLY REMAIN ABOVE THE 90 DEGREE LEVEL UNTIL MID- EVENING. 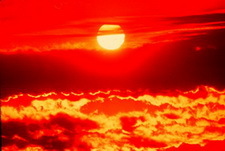 A HEAT ADVISORY MEANS THAT A PERIOD OF HOT TEMPERATURES IS EXPECTED. SUNNY SKIES…HOT TEMPERATURES AND LOW RELATIVE HUMIDITIES WILL COMBINE TO CREATE A SITUATION IN WHICH HEAT ILLNESSES ARE POSSIBLE. DRINK PLENTY OF FLUIDS…STAY IN AN AIR- CONDITIONED ROOM…STAY OUT OF THE SUN…AND CHECK UP ON RELATIVES AND NEIGHBORS. This entry was posted on Friday, August 1st, 2008 at 5:08am MDT and is filed under Colorado Weather, Thornton Weather. You can follow any responses to this entry through the RSS 2.0 feed. You can skip to the end and leave a response. Pinging is currently not allowed.